▲ An Awesome Iron Viz! The need to display data in a visual manner is something that we all strive to do. But to create a visual that is both informative and beautiful, it takes analytical understanding and artistic ability. The 2017 Iron Viz champion, Tristan Guillevin, created this Viz using some Zillow housing data in 20 minutes time! 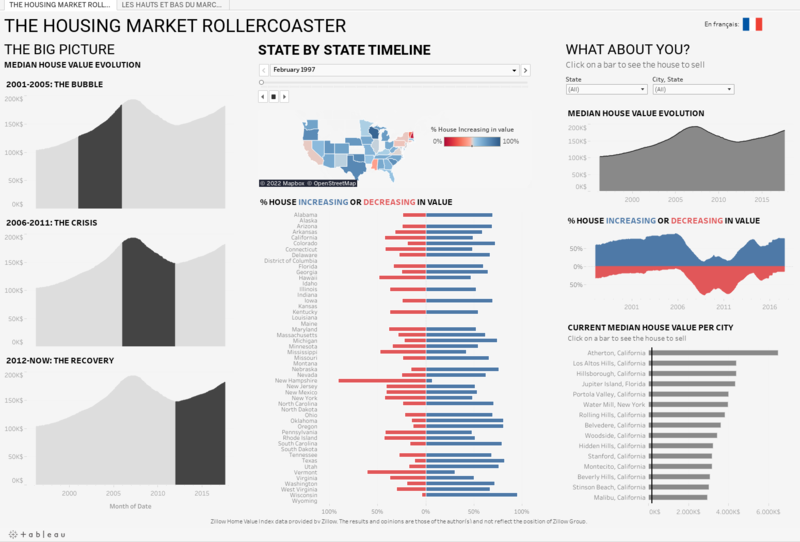 It is amazing what one can do with a little practice and understanding of Tableau! + The Iron Viz challenge can be watched at our TC17 Live site: Sign Up | Tableau Conference Live , creating an account is free and it gives access to a myriad of training, keynote speakers, and of course Iron Viz! + Register for Tableau Conference Live and watch the Tableau Keynotes, 200+ breakout sessions, and the Hands-On training sessions with their related workbooks and content. + Tableau Conference 2018 #TC18 is open for registration. https://tc17.tableau.com/ is where you will find the link. Now is the time to get the best rooms and rates on flights. + Tableau has several new and updated resources available for your exploration in the community including Logshark v2 and TabMon v1.2. This week we are happy to share that Neil Lord has achieved the Questions for Breakfast badge awarded for 25 correctly marked replies in the forums. Thank you Neil for all your contributions! Peter Fakan and haitham Farouk achieved the "I love helping!!" badge this week marking his first 25 replies marked as Helpful. Thanks to each of you for sharing your knowledge and ideas with each other to make the Tableau Community the best. The Top 'Liked" post this week started with a simple offer to the Tableau Community, specifically those working with non-profits, to work with a Zen Master, Shawn Wallwork. Offering up free appointments to those working in nonprofits, there has been several comments commending Shawn for the offering. Thank you for the generous offer Shawn and we cannot wait to see some of the spectacular Vizzes that you create. The top voted idea for last week is Allow Server Administrators To View As Other Users originally created in April of 2016. This feature is asking for the capability of viewing Tableau Server from the perspective of one of the users. Giving the ability to review permissions and other settings in a live format.